A murder investigation has been launched after a man was fatally stabbed at a youth club in Brixton. Police were called at approximately 18:45hrs on Thursday, 21 February to reports of a man stabbed on Minet Road, SW9. Officers attended and provided the victim with first aid. London Ambulance Service and London's Air Ambulance also attended. The man, aged 23, was pronounced dead at the scene at 19:27hrs. His next of kin have now been informed. Although we await formal identification officers are confident they know the identity of the deceased. A post-mortem examination will be held in due course. The Homicide and Major Crime Command have been informed and will be leading the investigation. A number of detailed forensic and CCTV footage related enquiries are in hand and police are appealing for information. Detectives are particularly keen to hear from those who were at the youth club - which was open at the time of the attack. Anyone with information about the attacker(s) is urged to get in touch. At this early stage, no arrests have been made. Enquiries into the full circumstances of the attack are ongoing. A crime scene remains in place. Anyone with information is asked to call police via 101 quoting reference 6414/21Feb. 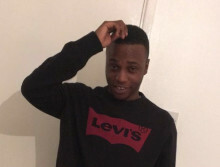 A 23-year-old old man who suffered fatal stab wounds in Brixton has been named as Glendon Spence.